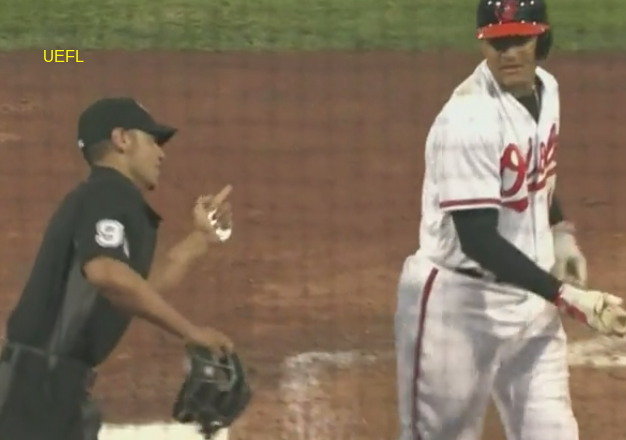 HP Umpire Joey Amaral ejected Orioles 3B Manny Machado for arguing a strike three call in the bottom of the 6th inning of the Tigers-Orioles game. With one out and none on, Machado took a 2-2 fastball from Tigers pitcher Shane Greene for a called third strike. Replays are objectively inconclusive as to the precise location of the pitch (pitch f/x unavailable), the call was irrecusable. At the time of the ejection, the Tigers were leading, 2-0. The Tigers ultimately won the contest, 2-1. This is Joey Amaral (-, but wearing Will Little's #93 plate shirt)'s first ejection of Spring Training 2016. Joey Amaral now has 0 points in the UEFL Standings (0 Previous + 0 ST + 0 Irrecusable Call = 0). Crew Chief Chad Fairchild now has 0 points in Crew Division (0 Previous + 0 ST = 0). This is the second ejection of the 2016 preseason. This is the 2nd player ejection of Spring Training 2016. Prior to ejection, Machado was 0-3 in the contest. This is the Orioles' 1st ejection of Spring 2016, T-1st in the Grapefruit League (BAL, NYM 1; Others 0). This is Manny Machado's first ejection since May 28, 2015 (Toby Basner; QOC = Y [Check Swing]). This is Joey Amaral's first career MLB ejection.